The Duo Family Battle Continues for the Pro4 Lead. The most anticipated racing of the year took place this Labor Day weekend at the storied Crandon International Raceway. Each year, the 1.5 mile Crandon track delivers its own unique form of racing entertainment for which droves of faithful fans have been enjoying for nearly 50 years. 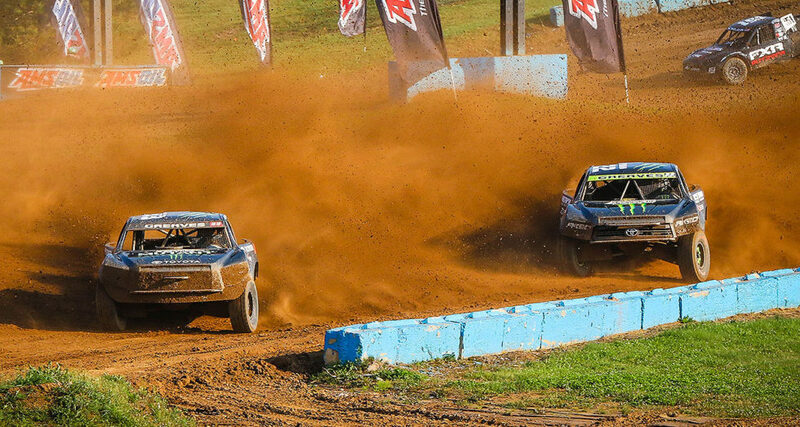 This year, the combination of TORC–The Off Road Championship’s round 11 on Saturday and the World Championship Cup Races and AMSOIL Cup race on Sunday was an overdose for anyone’s short-course racing addiction. The Greaves Duo and Yamaha UTV team were poised and ready to take on not only their TORC series competition, but also the contingency of West coast drivers including Kyle LeDuc, Bryce Menzies, and, after a 10 year hiatus, Carl Renezender returned to Crandon. They looked to continue their march towards multiple championships that will culminate in late September in Elk River, Minnesota. A record crowd endured torrential rains, remnants of Hurricane Harvey, that dowsed the track in the early morning hours ahead of Saturday’s racing action. The legendary Crandon track crews worked feverishly to keep the mud under control and provide a great racing surface for the weekend. CJ Greaves won again in Pro Stock UTV, making it 10 in a row for his Monster Energy Yamaha in Round 11 action. Jake Lunderby also put in a great performance, coming in 2nd behind CJ. He also jumped up a spot in the standings to 4th. Rodney VanEperen edged closer to the number 1 position in points by turning in a 2nd place finish in his PowerSports1/Maxxis Tire Yamaha Pro Mod class race. CJ Greaves broke the Duo’s Pro4 tie with a next to the last turn pass of Johnny Greaves, who led 8 of the 9 laps in the race and ended up in 2nd. Only 2 points separate 1st and 2nd going into the final weekend of racing. Sunday was a hodgepodge of East vs. West in The World Championship Cup races. Jake was a victim of over aggressive driving and came in 4th after leading most of the race in the Pro Stock UTV World Cup in a field of nearly 40 UTV’s. Rodney got his first World Cup win in the Pro Mod class enduring a hard fought battle with Farr and Chaney that came down to the final turn. CJ also had a great run. However, while in the lead, he landed hard off of one of the many Crandon jumps that broke his right rear that sent his wheel careening off the track and sidelining CJ. CJ landed a 3rd place finish in the Pro4 World Cup that was billed as a East vs. West showdown. Johnny Greaves finished 4th in the AMSOIL Cup race that had the Pro4’s competing against 2 classes of Pro2’s. The Pro4’s passed their 2-wheel drive counterparts on the final lap. 25-Pro Stock UTV’s lined up for Crandon’s famous land rush start. CJ got lost in traffic but made up ground quick after taking the Potawatomi turn one. He had his Monster Energy Yamaha Racing/Maxxis Tire/Yamalube YXZ 1000R #933 in 3rd before the end of lap 1 and in the lead by lap 3 of the 12 lap race. Jake Luderby was also on the move. By lap 6, he had moved up to 3rd at the halfway point of the race. CJ led the field to the green flag restart and checked out. Jake however was in a heated battle with Pointon for the 2nd place spot. Pointon biked it in the gravel pit turn giving Jake the opportunity to make the pass for 2nd, where he finished the race with CJ taking the win. Travis Pointon took the early lead in the Pro Mod UTV but turned it over to Kyle Chaney when something broke and spun out. The PowerSports1/Maxxis Tire #845 machine of Rodney VanEperen was in 3rd when Chaney also experienced a problem moving Farr into the lead and VanEperen into 2nd. Things did not change much for the front runners after the competition caution. Farr went on to take the win with Rodney coming in a close 2nd. The points leader, Kyle Chaney finished 6th, giving Rodney enough points to close the points gap to only 7 points. Eight trucks were on the line for the Pro4 competition on Saturday. Johnny was in the middle with CJ close by on the outside. Johnny Greaves won the Potawatomi turn 1 holeshot to start the 9-lap race. While Johnny checked-out, CJ was in a 3-way battle for 2nd with Chad Hord and Ross Hoek. On lap 2, Hord lost it in the hairpen corner on the backside of the track causing a Ponsse log jam, causing CJ, Douglas and Hord to stop dead in their tracks. Hoek, was not involved and scampered away. Douglas pulled away first. When CJ got his Monster Energy/Mutant Soda Toyota underway, the competition caution would save the day for the younger Greaves. On the restart, Johnny continued as the front runner. However, CJ was on a mission. He cleared Douglas and Hoek and set his sights on his dad, who had a huge lead at this point. With 2 laps to go, CJ began to gnaw into Johnny’s lead. On the final lap, CJ had caught Johnny and the family feud was on. With 2 turns to go, the two got together slightly, which was enough to break Johnny’s momentum giving CJ the opportunity to pull away and take the lead and the win. Johnny, after leading 8 of the 9 laps of the race, came in a close 2nd. The win broke the tie giving CJ only a 2 point advantage going into the final racing weekend. Sunday’s races were the much anticipated East vs. West World Cup races boasting the largest payout in short-course offroad history with over $200,000 on the line. Nearly 40 UTV’s lined up on 2 rows for the land rush start in the Pro Stock UTV World Cup. CJ did not run in the Pro Stock, electing to run in the Mod class. Jake Lunderby would be the loan team representative in his Yamalube/Maxxis Tire Pro Stock UTV. In a race marred by over aggressive driving, roll-overs and crashes, Jake ran a great race, pulling out to a lead which he held up to the competition caution. The racing heated up dramatically when racing resumed for the second half of the race. The top 3, including Jake, went 3-wide at times. Eventually, one of the racers got into Jake’s Yamaha, breaking his momentum, and sending him back to 4th on the final lap. He would not be able to make up ground and had to settle for a 4th place finish, just off the podium after leading most of the race. Much like the stock class, the Modified UTV class was loaded to the gill with nearly 40 machines lining up in 2 rows for the start. Both Rodney VanEperen and CJ Greaves were on the front row and cleared the Potawatomi turn 1 holeshot in 2nd and 3rd. The mod class was also plagued with rollovers and aggressive driving. Pointon passed Rodney for 3rd but would over rotate and flipped-over in the gravel pit turn. CJ was making his move at the same time, but a full course caution kept him in 2nd and Rodney now in 3rd. CJ was pressuring Luberg who developed a loss of power sending CJ to the lead at the competition caution. CJ pulled away to nearly a 6 car length lead. Chaney was in 2nd with Rodney VanEperen in 3rd. As the laps wound down, disaster struck for CJ Greaves. When he landed off the “sky box straight” jump, his right rear wheel gave-way, his wheel passing him as he pulled off the track and out of the race. The top 3 made up of Farr, Chaney and VanEperen pulled away for a last lap showdown. On the final turn, the 3 were neck-in-neck when a lap car split the leaders. Rodney made the correct move and pushed ahead for the win to claim his first World Cup championship. The Pro4 World Cup race was filled with 10 trucks made up of TORC Series and West Coast Lucas Oil Series drivers including Kyle LeDuc, Bryce Menzies and Carl Renezeder. Johnny and CJ Greaves followed Bryce Menzies through the holeshot with CJ Greaves in 2nd, LeDuc in 3rd and Johnny in 4th. The top 3 raced nose to tail to the end of the race, each one hoping for a mistake that would give them the advantage. Menzies cruised on to the win while CJ could not capitalize on the LeDucs mistakes and settled for the 3rd spot on the podium. The final race of the weekend was the annual AMSOIL Cup. This year added a new twist to the starting line. The Pro2’s are given a head start on the Pro4’s. The Luca Oil Series Unlimited Pro2WD class was sandwiched between the Pro2’s and Pro4’s. It took the Pro4’s to the last lap to catch the Pro2’s. Both Greaves were not able to get around the 2-wheel drive trucks in time to challenge for the win. Johnny was able to get the closest with a 4th place finish. The TORC Series will wind down its 2017 season on September 22-24, at the ERX Motor Park in Elk River, Minnesota for rounds 12 and 13. The twin cities will play host to the season’s climax at one of the most challenging tracks on the circuit, complete with extensive elevation changes, high-banked corners, massive jumps with multiple race lines. Championships will be settled in the Pro4 class with Johnny and CJ in a close points battle. CJ, who has not lost a race in Pro Stock UTV is the apparent champion with Rodney VanEperen in striking distance of the championship in the Pro Mod UTV class. Jake Lunderby is hoping for a top 3 in the Pro Stock UTV class. Be sure to watch all the replays and race coverage on TORCseries.com and their YouTube Channel. Don’t miss the World Cup races to be broadcast on Red Bull Signature Series – a special 90-minute highlight program scheduled to air on Saturday, October 14th at 3:00pm (EDT) on NBC. Way to go Johnny CJ Jake and Rodney!